Mainz Gladius Swords for sale are 28 5/8th inches in all. These popular swords are inspired by real Roman Gladius but have modern features like the functional 1075 high carbon steel blade. The sharpened 18 ¾ inch blade is hand finished and hand polished. The blades are heat treated and annealed to about 50-55 HRCs. The finger grooved handle is made of genuine dark walnut with leather accents. The custom fitted scabbard is crafted in real walnut with antique metal. 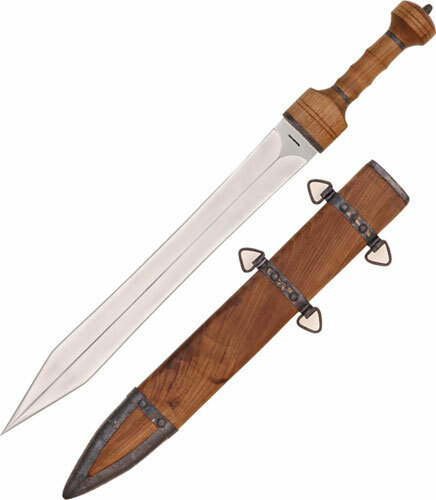 Buy the popular Mainz Gladius Swords for $169.99.